Hi! 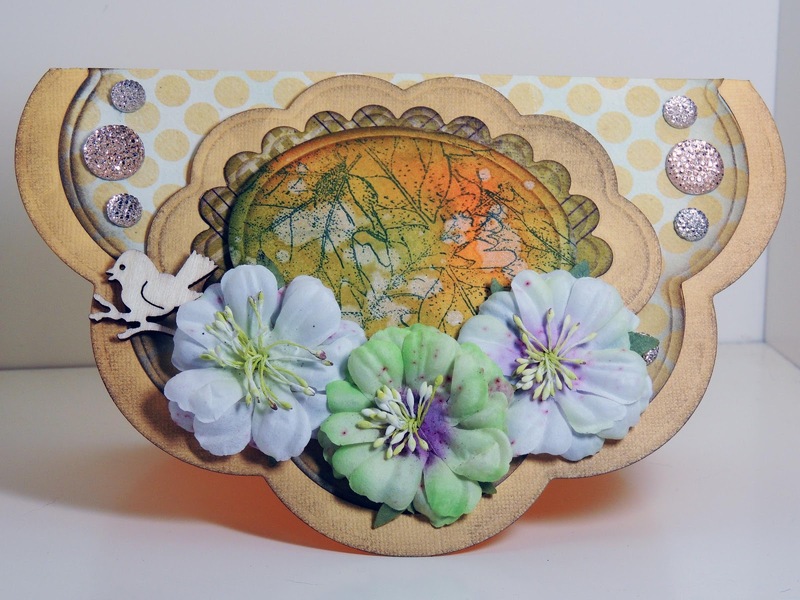 Lis here with another card created with the pretty Family Is BoBunny Collection. I chose Drama, a pretty pattern with circles/text. I added a piece of torn handmade paper (brown with gold touches). I cut out a tag from Silly, added a rub on to it and edged it in gold. 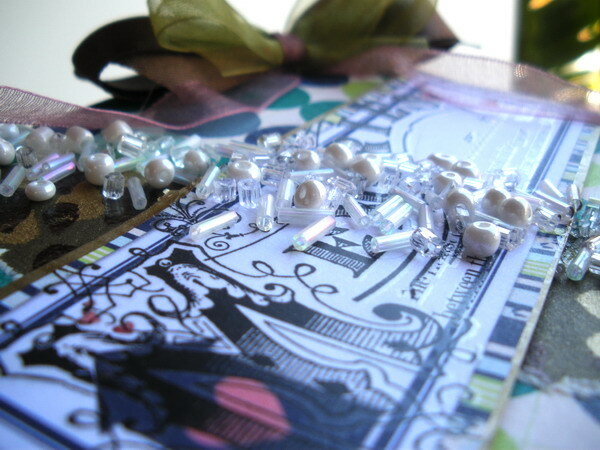 I wanted to add a bead mix to my card so I laid my tag flat onto my card (no glue). I added some Ailene's Tacky glue next to and overlapping my brown piece of paper. I used my finger to spread the glue out. 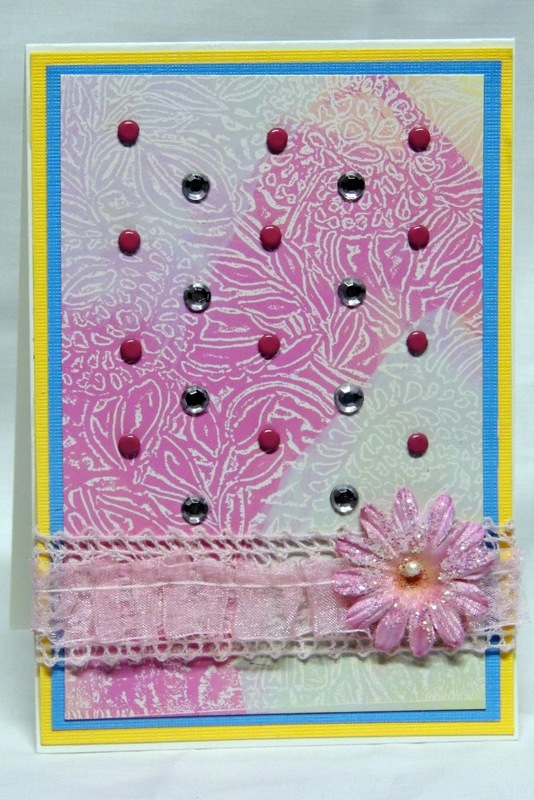 Then I took some bead mix and poured it over the tag and the card. (I used a pan so I wouldn't make as much of a mess as I usually do!) I let the card dry over night. Once dry I removed any loose beads. Then I carefully pulled up the tag. I added mounting tape to the back of my tag and adhered it to my card. I added the bow last. I used three kinds of ribbon in this bow. 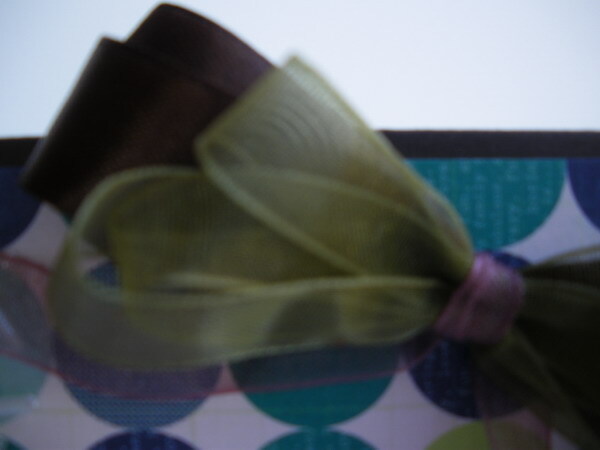 I used brown satin for the back, green organza for the front and I tied the bows together with a mauve organza. 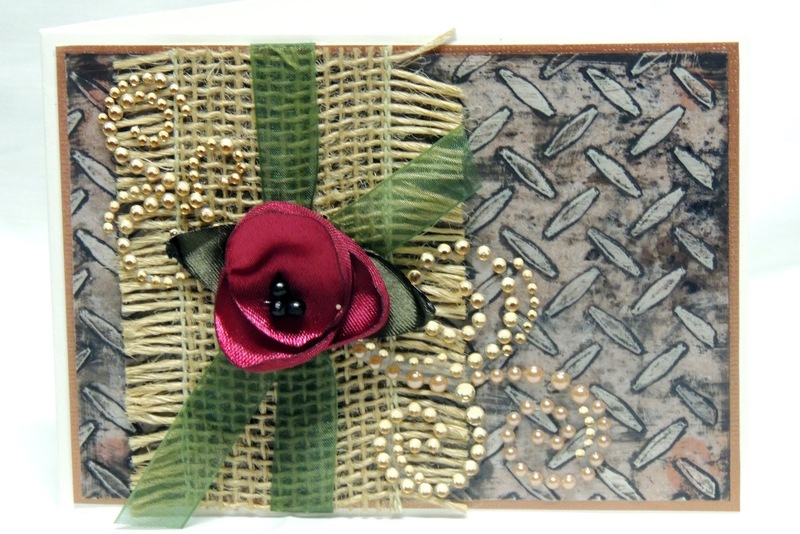 I left long tails of the mauve organza that I glue-dotted across the top and side of my card. I hope that you liked my card. I have two more cards that I made with the Family Is Collection. Watch for them! At the end of last year my youngest daughter turned 13 and officially began high school this year. 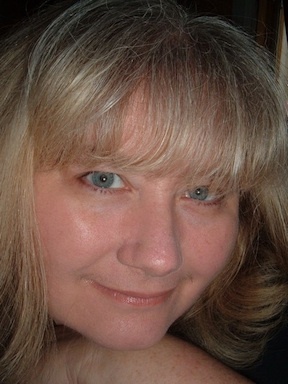 Sadly for her, her birthday is 4 days after Christmas day when everyone is wound down and tired of celebrating. Despite this, we made a huge thing of her 13th birthday and I decided to use the cake photos on a scrapbook page for her to remember. 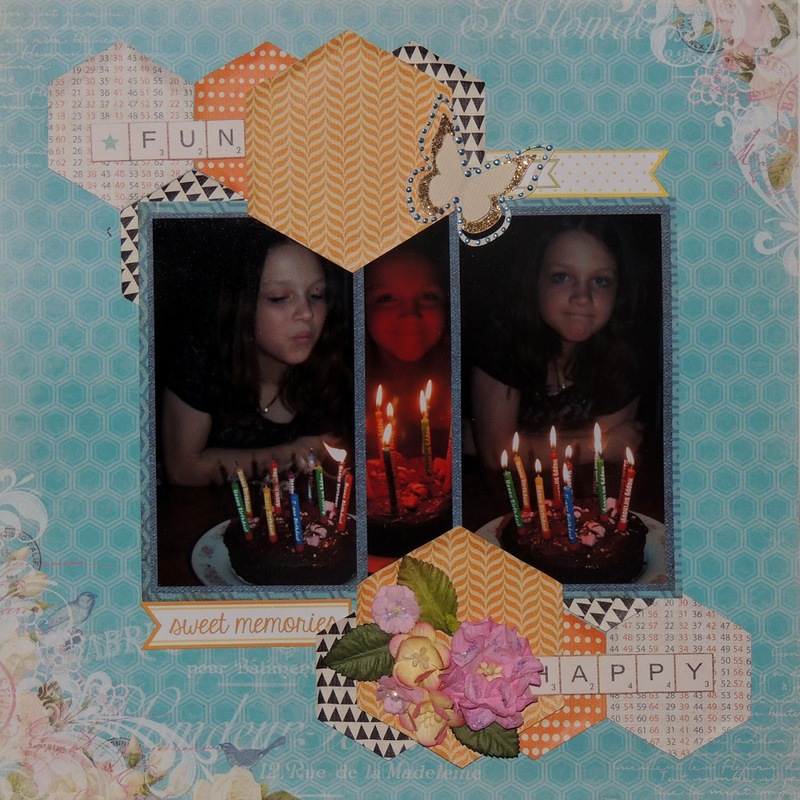 This was quite a quick scrapbook page, the most time I spent on it was deciding where to put all the hexagons that I cut. This card was created to send to a friend who has had a rough time lately. I think the Moon Child image from the Frantic Stamper line of cling mounted images is the perfect symbol for some one you is trying to rise above turmoil. To create the card, I stamped the image with with Memento Tuxedo Black ink and colored with Copic Ciao Markers. The silver mats are actually leftover wrapping paper from Christmas. The background paper is Die Cuts With a View's Luxury Collection. Add some ribbon and Kaiser's Silver Mixed Round Rhinestones to finish it off. Thanks for stopping by! Today I am really excited to bring you the news from the warehouse. There is something brand new coming to the Frantic Stamper line, and Fran is letting me announce it since I had an big part in its development. I am thrilled to announce a that Frantic Stamper is launching a new line of the Precision Dies, available to ship on May 1st, and available for pre-order, now, at www.FranticStamper.com. You are probably curious about my role in this enterprise. Well, I drew the artworks from which the dies were made. This has been so much fun, and I am so happy with the results. 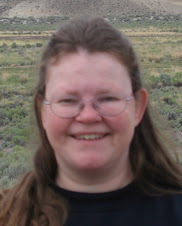 I can't wait to get my copies of the dies, and I hope you will want them, too! First, I'd like to share our France themed set. 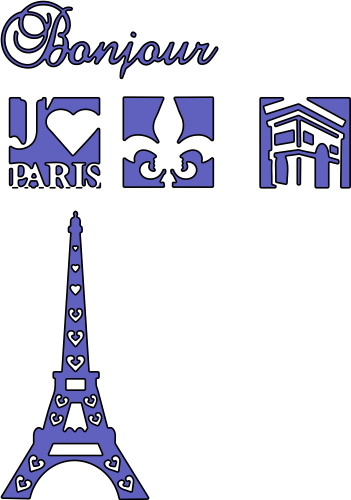 The Eiffel Tower measures about 4" tall and 2"wide. "Bonjour" is about 3" long and 1" high. The squares are 1.25" square and are designed to work with our 1.25" Precision Die Squares line, as well as by themselves. One thing that is interesting about the squares dies is that what you see in white is what is left behind when you cut with the die; the blue areas are removed (just the opposite of the other dies.) So, the shape or words will remain attached to the body of your paper or cardstock, inside a cut-out square. Fun, n'est ce pas? This is true of all the squares dies in this new line. Next we have our Americana set. Our eagle measures out to around 3" x 2 3/4". 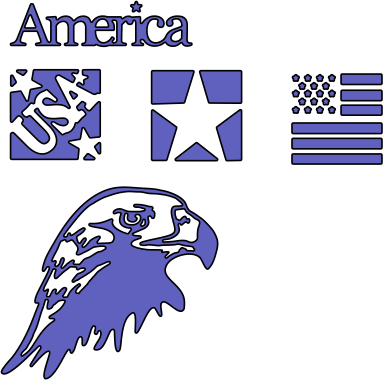 The "America" is 2 1/2" long by just under 3/4" high, and again, the squares are 1.25" square. Don't you think these are just perfect for the upcoming Independence Day holiday or for a scrapbook page to celebrate a member of our Armed Forces? The remaining dies in the release are just fun decorative scrolls or borders. The ivy scroll is about 3 3/4" long, and just over an inch high. 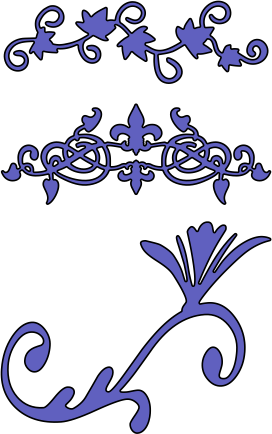 The Fleur de Lys scroll is approximately 3 3/4" long by 1 1/2" high. 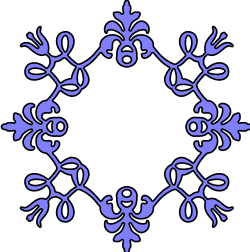 The Flower scroll measures about 4 1/4" by 2 1/2". And the scroll square is about 3 1/2" square. craft die-cut machines and can be used on paper, card-stock, felt, fabric, thin cork, and shrink plastic. I hope that you will check out the new collection and give them a try. More dies will be coming soon, too! I have been a busy girl! I started out my card by creating a card base 6 x 6 inches out of kraft card stock. I added gold glossy to the front and then matted a solid blue with my patterned paper. 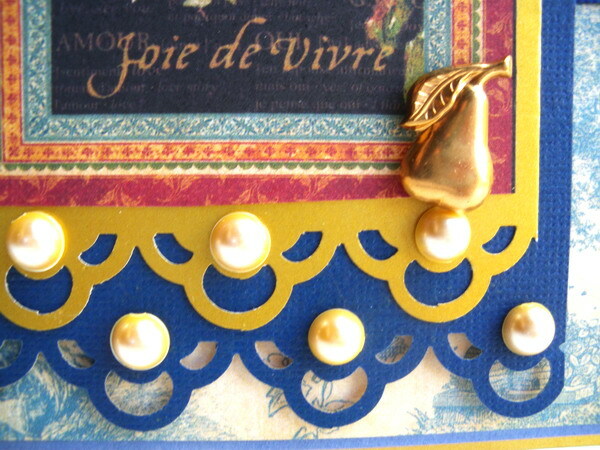 I used a dark blue card stock (note that I didn't distress the paper at all) and more gold glossy - and finally the beautiful picture of the pears (which I cut out form one of the sheets from the French Country Collection). I added champagne pearls and a little brass pear that I had. 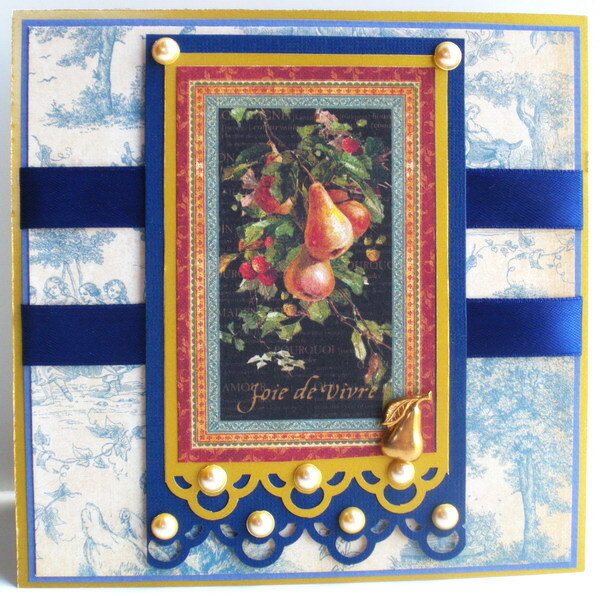 The border punch I used here is fairly new. It has just the right amount of laciness! This is the sketch for the month of April. The design team members have made some cards using this simple sketch, and would like to share them with you today. We hope that you will be inspired to make a card of your own. If you do, please share by leaving us a link to your card in the comments. I really wanted to do something a bit different with this sketch so I chose to change it slightly and create it with clear acetate elements. The base of my card is a sheet of clear acetate that I then layered onto. The centre has been decorated with a Frantic Stamper rubber stamp called 'Deco Vases'. 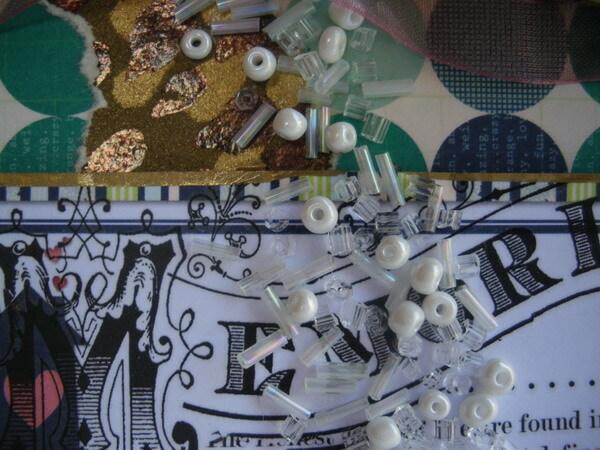 Three 1/4" circles were punched from a piece of scrap card to which some of the same washi tape was added. They were shaped using a stylus to form faux brad heads, which were then affixed to the card with small dimensional glue dots. And lastly, the faux brad heads were covered with a bit of Glossy Accents, as were the bubbles in the mermaid image to give them added dimension and shine. Without drying time the card could have qualified as a Card, in 10 featured card! For her card, Jennifer chose to use the Frantic Stamper Large Rose stamp and some BoBunny Serenity paper from the 6x6 paper pad. She stamped and colored her image and then fussy-cut it out, and mounted it on her circles. She finished the card off with a birthday greeting sticker. Lis chose to take a less-literal approach to the sketch. 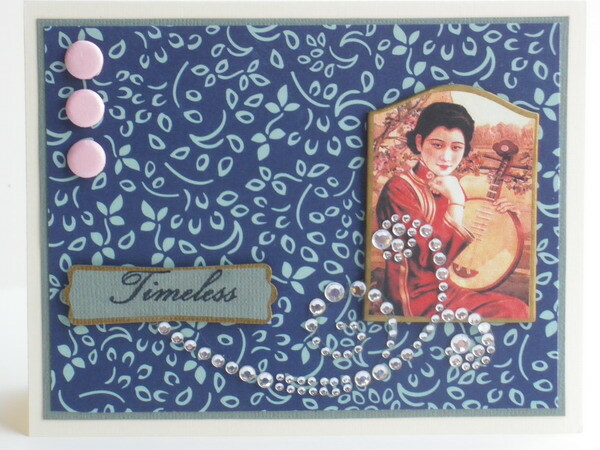 WIth a beautiful image and a bit of bling, we think her card is indeed timeless! 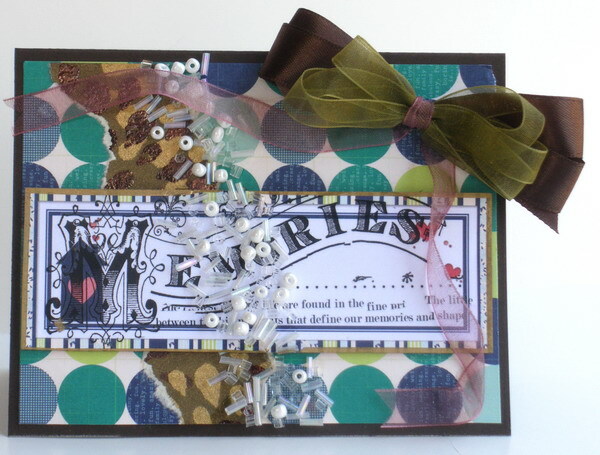 She used Graphic 45 Bird Song and Bo Bunny Family Is- In Mischeif papers, Candi embellishments, and some beautiful Prima Crystals to make her creation. 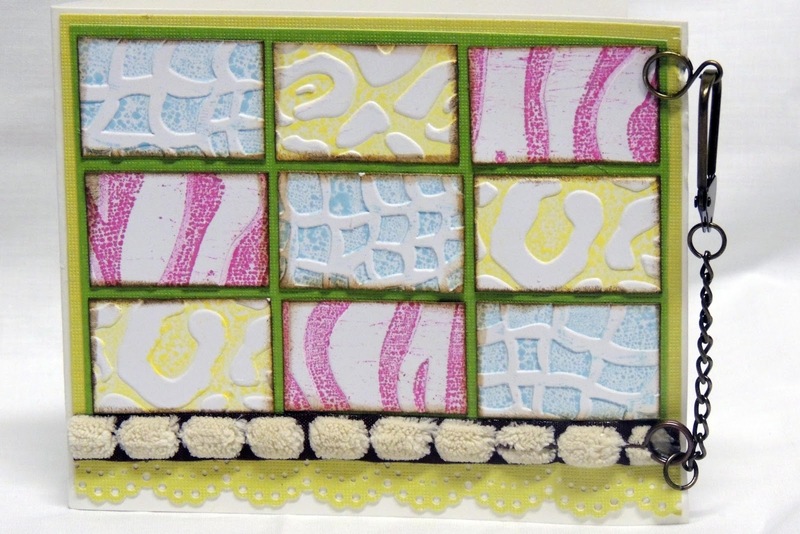 Julie Ebersole has a bright little spring card from Hero Arts to share with you. We hope you will enjoy it! You wouldn't know it from the rainy weather we're having here in Southern Oregon, but Spring is in bloom in our crafting projects! Just in, the new line of dies from Sizzix designed by renowned floral paper artist Susan Tierny-Cockburn. 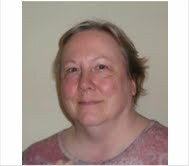 Susan has been creating paper gardens using punches for several years. Now, with this new series of dies, the cutting is even easier! These beautiful 3-D blooms are sure to bring sunshine into your home! 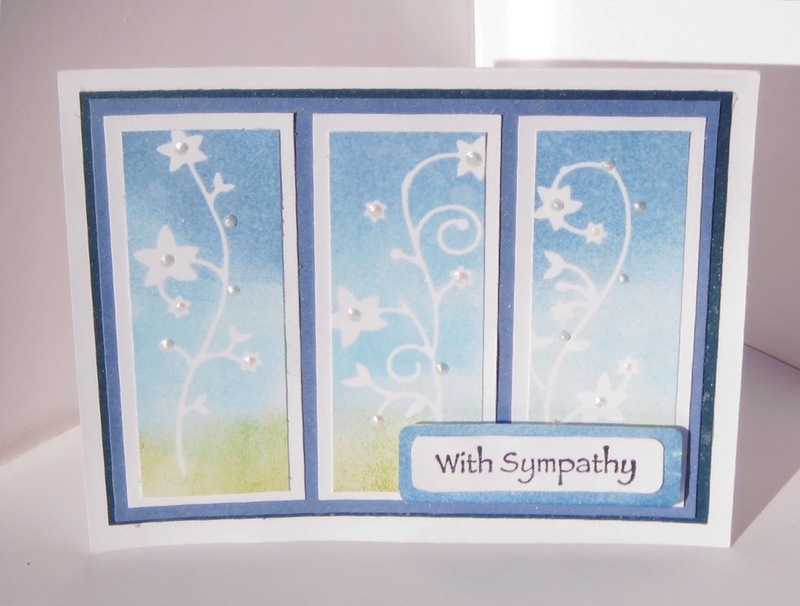 Sympathy cards are just hard for me to make. I seem to block every time I need to make one. But lately I have just needed to make a lot of them. I lost an aunt and an uncle, a neighbor, and a friend in the past couple of months, and friends and extended family have also lost people near and dear. So I have been struggling to get cards done for those who deserve my condolences. This is one of the cards I came up with. 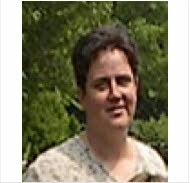 It is a card that I felt could be used to send to either a man or a woman, and it is one I could replicate fairly easily, so it will be a "go to" design. To make the card I started by die cutting some flowers out of Eclipse masking paper using Flowering Border Vine die from Memory Box. I removed the flowers from the backing paper (a little tricky since the piece is a bit delicate and fragile), cut them into three pieces, and placed them onto the three panels I had cut from white card stock, forming masks. I next carefully sponged on distress ink in two shades of blue (Tumbled Glass and Faded Jeans) near the top and center of each panel, and in Peeled Paint green near the bottom of each panel, being careful not to disturb the masks. I carefully removed the masks, and set the panels aside. Once completely dry, I trimmed them and mounted them to white panels. I made a mat layer by using DTP with the faded jeans ink pad, and spritzing lightly with water with Pearl Perfect Pearls in it. I mounted a navy blue layer to my card, and the mat layer onto the navy blue layer. I then mounted my three panels to the mat layer. I stamped my saying, trimmed it, and used a corner rounder to round the corners. I mounted it to a rectangle of mat created the same way I did the bigger layer, and rounded those corners. I then mounted the whole saying piece to the card with foam dots. 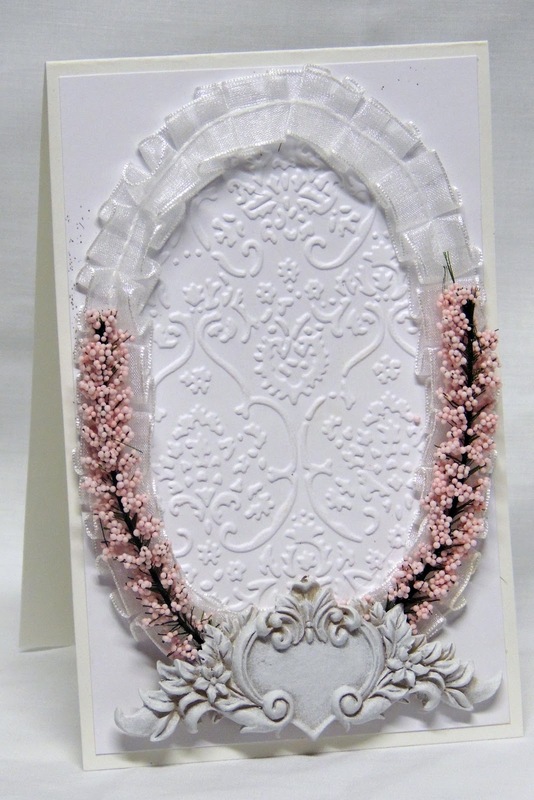 Lastly, I added some dots of white with a Viva Pearl Pen to the centers of some of my flowers and randomly along the vine, and set the card aside to dry. It is now on its way to someone who could use a few words of support. I really am enjoying creating art journal pages at the moment, especially with all the fantastic products now available to make creating so much easier. Take for example, the newest Dylusions stencils that feature silhouettes of people. These stencils come with both a positive and a negative image that I used to create this page! I began my page first by cutting out the remaining bits of the stencils that held the figures, then layered the main section over my page. I used the red ink and sprayed it over the first silhouette, allowing it to spray over onto the centre one and I did the same thing with the blue spray over the third figure. When I spritzed and wiped over each figure, the colours of the centre figure mixed and blended. Once this was thoroughly dry, I layered the individual silhouette stencils over the inked figures then painted in the background using a mixture of blacks, greys and whites. Once this was dry, I used the subway stencil and a mixture of embossing paste and gold Perfect Pearls to stencil in all the lines. 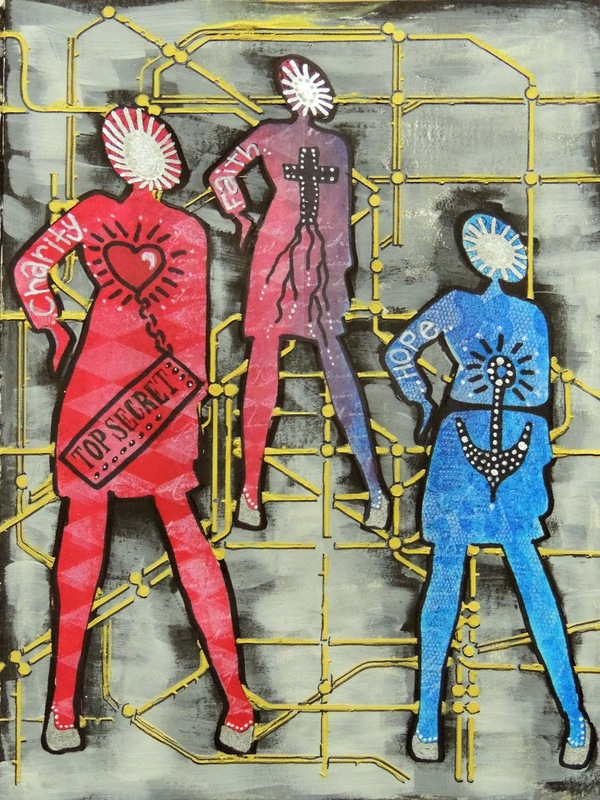 When finished I pulled up ALL of the stencils to reveal lines that appear to go behind my silhouette figures! As a final touch I re-layered the first stencil over my page and stamped background images over the silhouettes. I used the Frantic Stamper Harlequin Background stamp over the first, the Great-Grandfathers Letters background stamp over the centre silhouette and the Lace Background stamp over the third and final silhouette. To complete my page, I used a variety of markers to add in details such as the heart, faceless faces, the anchor and the cross. Recently, I came across a card similar to this that just stuck in my head. A simple image, text running vertically up one side and only 3 colors, it was so simple yet it stood out. I immediately knew that Je t'aime (I love you) and a single rose would be perfect for this type of card. Today we would like to share a great video from Graphic 45, showing how to make pleated flowers. We hope you'll enjoy the project in the video. 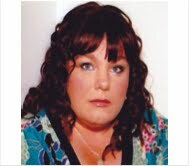 Be sure to check out the fabulous Graphic 45 products at www.franticstamper.com! Until our next video share, happy paper crafting! I promised that I would be making Christmas cards throughout the year and that I would share at least one every month, so today's card is part of filling those promises. 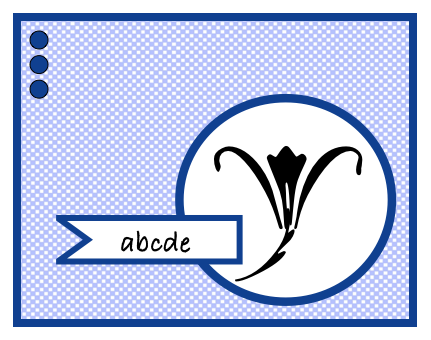 The card is 4 1/4" square so it can be mailed in a standard a4 envelope, but with consideration taken for the dimension of the poinsettia button. To make the card I started by scoring the front of my card, 1/2" and 3/4" from the edges (and the fold) using a scoring tool. I continued the card by cutting a hole in the center of the front of my card with the 1" single square die from Frantic Stamper Precision Die set #1. On the inside of the card front, I used foam tape to adhere a square cut with the quad-size square from Frantic Stamper Precision Die set #3. 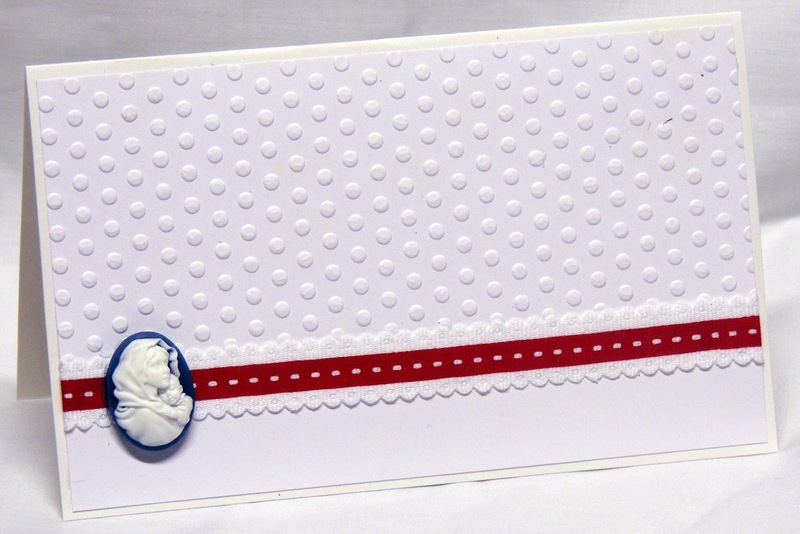 I then adhered the poinsettia button inside the recessed square from the front of the card. And finally, I created a raised frame for the recessed square. I started by cutting a 1" square in the center of a quad-sized square made with the quad-sized square from Frantic Stamper Precision Die set #4 and adhering it to the card front with foam tape. Then I cut a 1 1/4" square using the single square die from the Frantic Stamper Precision Die set #2 in the center of a quad-sized square made with the die from set #3, and adhered it with foam tape. I hope this card will inspire you to get an early start on your holiday cards! This card may sound complicated to have made, but it was SO simple to do because of the Precision dies! If I can find more poinsettia buttons, this card is going to be one I make more of for this holiday season! Here where I live it feels like anything but Spring but that didn't stop me from creating a card that reflected this whimsical idea of the perfect time of the year. To create my card base I used a Spellbinders Grand die and my Grand Calibur and simply folded it in half. One trick I will mention is that I folded over the back scallop on the bottom so that I could keep the front scallop without my card rolling off to one side all the time. 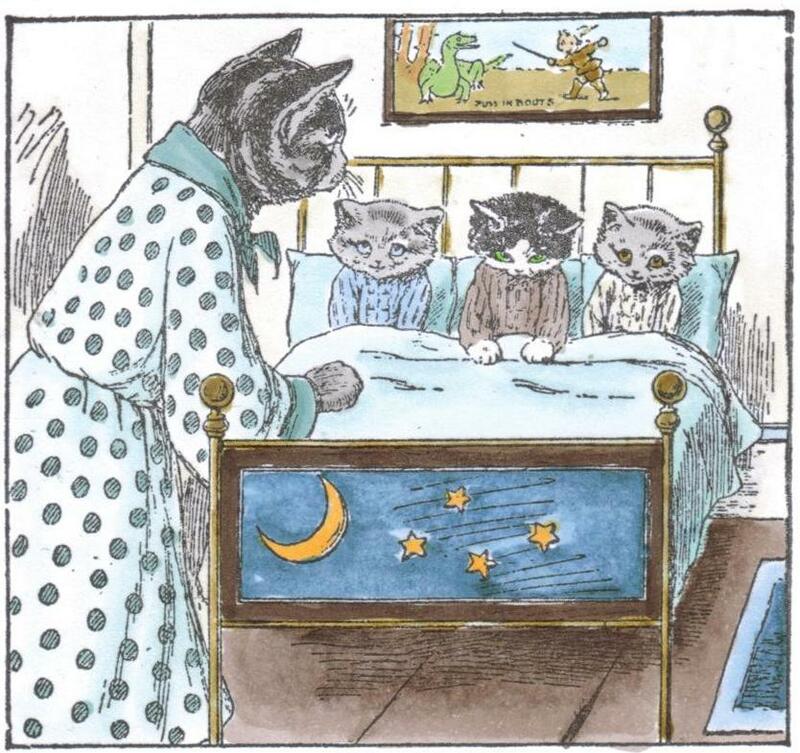 Today I chose to color this cute little FranticStamper image of three kittens being put to bed by their mother cat. I stamped it onto white card stock with Memento Tuxedo Black ink, and then colored it with Copic Markers. There was a time when Embossing folders were all the rage. The moment they were released they were grabbed but like most crafters, I didn’t really do very much with mine other than run a piece of card through a die cut machine to emboss a background for a card. This is why, despite having a loads of embossing folders, I rarely use them!! I ironed the embossed wax paper over the glossy paper after embossing it, I then inked over the cardstock leaving a pretty patterned effect. 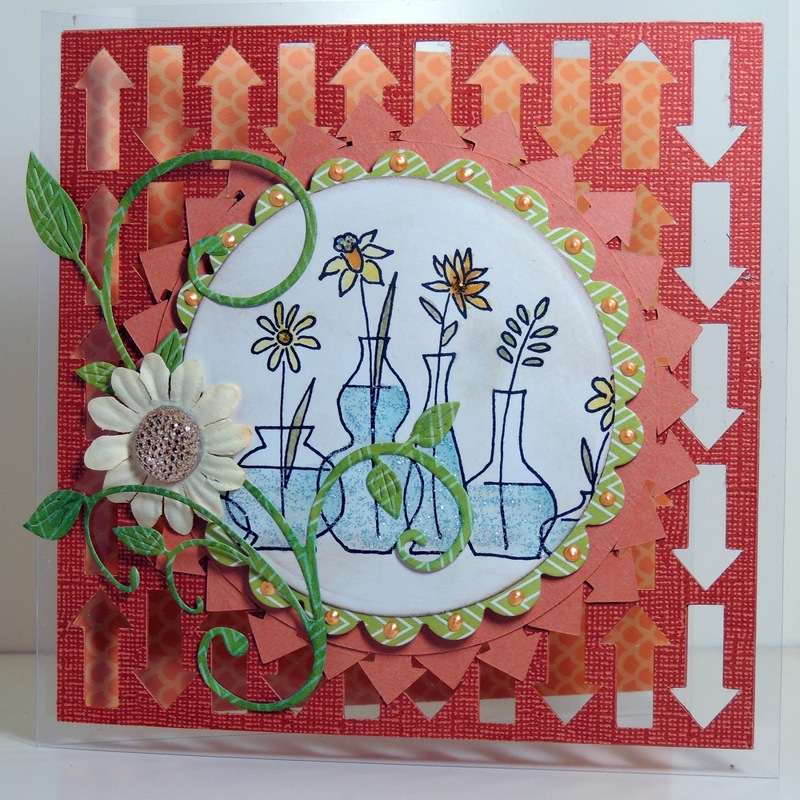 Emboss squares of cardstock with different designs then piece together to form a quilt effect. 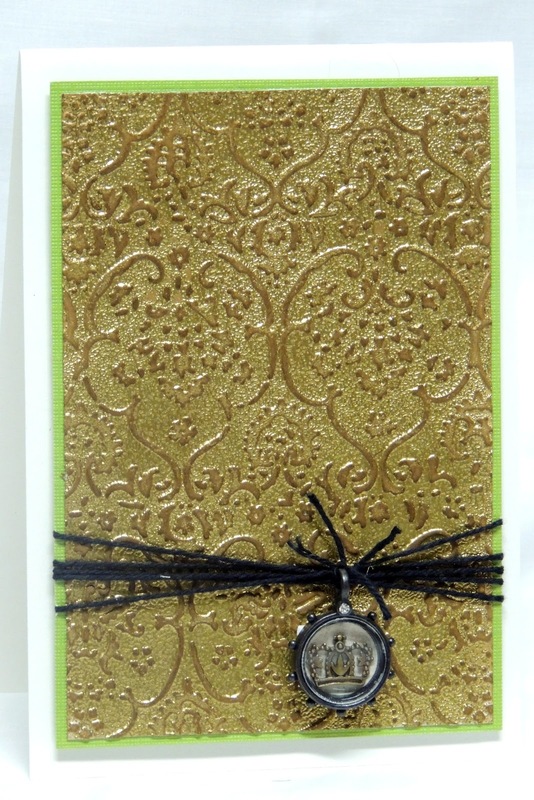 I chose to ink the raised surface of my embossing folders prior to embossing so that I had some added colour. The embossing folders I used already came in strips so I cut them into sections to piece together to form my quilt effect! Emboss pieces of acetate then add a layer of paint over the surface and either add a contrasting colour or sand the raised parts for a distressed look. After embossing my piece of acetate I painted a layer of a sand coloured paint, waited for it to be almost dry them rubbed over it with a scrunched piece of wax paper. I then repeated these steps using a black paint. Embossing with powders and a heat gun is often called wet embossing and when combined with an embossing folder, can look really effective. For my card I chose to emboss my card with an inked embossing folder (I used a clear embossing ink) then added embossing powders over this and heat set it. As an added step I then inked over the whole surface in an alternate colour for added dimension! There is currently a great set of diffusers on the market created by Darice and Sizzix BUT you can also use household items to create your own. This technique is fairly similar to the one above with diffusers, the difference is, only a part of the embossing sandwich is placed between the folders so that only a part of the cardstock is embossed. To create this effect, I placed my embossing folder onto the die cut plates so that the part I didn't want embossed was hanging over the edge then ran it through the machine!